Listen to "Star Wars: Jedi Quest #1: The Way of the Apprentice" on your iOS and Android device. Fourteen-year-old Anakin Skywalker is strong in the ways of the Force. His lightsaber skills are exceptional, and his piloting is legendary. He should be an ideal Jedi apprentice. And yet, there is so much he still has to learn. It is up to Obi-Wan Kenobi to teach him these things. But on a mission to a planet threatened by toxic disaster, Obi-Wan and Anakin are separated. 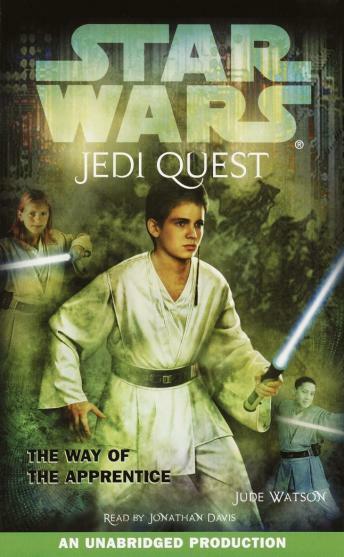 Anakin and three other apprentices - one of them his rival - must work together in order to survive. Anakin's instincts are clear...but are they right? Anakin Skywalker's destiny will determine the future of a galaxy. These are the events that form his fate. Great insight on Anakin, good story line.